I didn’t care for the film that the TV series was based on. Hell, I had to soldier through season one of ‘Buffy’. It moved slower than dry paint. BUT season one is necessary for things to come in the series. It provides the appetizer to what turns out to be one of the best dramedies ever broadcast on television. 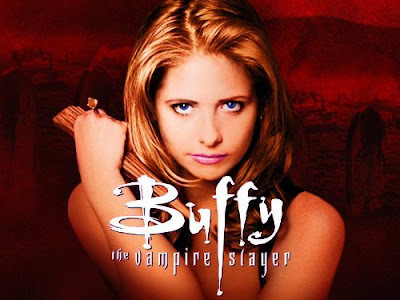 The series follows Buffy Summers as she trains to fulfill the role of Vampire Slayer. She comes from a long line of slayers and unlike those before her; she relies on her friends for aid. She also slays demons and other evil deities. Sure, the series comes across in a comic book sort of way. But that’s not a bad thing. It keeps things light. The series is filled with pop culture references that you may need to wiki-watch for better understanding. But then there are serious moments that show the series strengths in writing and acting. If you need proof, just watch ‘The Body’ episode from season five. The episode has been hailed by many critics as one of the best television episodes ever broadcast. I don’t want to tell you anymore than that since I’m not into giving away spoilers. Sarah Michelle Gellar didn’t receive an Emmy for that performance and I consider that a travesty. The show was stripped of its usual score and effects. And it drove the reason home as to why ‘Buffy The Vampire Slayer’ was too good to capture the attention of the masses. If the series had of been on CBS, FOX, ABC, or FOX they would have canned it during the first season. ‘Buffy’ is one of the few series that I purposely collected every season on DVD. I have turned a handful of people onto this series and if you haven’t tried it yet, do so. Do it as soon as possible. The series ran for seven seasons. And if you’re into musicals, check out the episode “Once More With Feeling”. I despise musicals, but dammit… I hate to admit it… It’s a fine, fine episode when the cast is under a spell of singing. The series finale… Yes. I loved it. In my opinion, they got it right. As for the spinoff ‘Angel’, I tried it. I didn’t care for it at all.